The name "tro-tro" derives from the old Ga word meaning three pence (the unit of currency used during the period of British rule in Ghana). At the time, three pence was the going rate for a single ride in the public transport vehicles that came to be known by the same name. Historically, tro-tros were Bedford trucks converted to hold passengers seated on wooden benches. Today, a tro-tro is a catch-all phrase for any public transport vehicle in Ghana that is privately owned and may be hailed at points along its route. The most usual vehicles are small Nissan buses, mini-vans or converted pick-up trucks. Although pence is no longer the currency of Ghana, tro-tros remain incredibly cheap, usually costing just a few pesewas. With no set schedule or route map, however, you'll need to follow the guidelines below to take advantage of this cheap and colorful transport option. Tro-tros have set routes. In cities they travel along all the major thoroughfares and are easy to find. Just ask anyone on the street for directions to the nearest tro-tro stop. For long-haul routes between towns, make your way to a tro-tro station where vocal young men act as touts for tro-tros headed to different destinations. Alternatively, you can flag a tro-tro down along the main road. Jabbing your finger up in the air as one approaches indicates that you want to go to the next big town. Jabbing your finger down to the ground means you want a local tro-tro that makes frequent stops. While tro-tros have set routes, there are no written schedules - making it difficult to know what these routes are. Most local people are familiar with the different services, though, so the best option is simply to ask. If you are in Accra, most of the central sights including Osu, Makola Market, and Jamestown are covered by tro-tros whose "mates" yell "Accra! Accra! Accra! ", or "Circle!" for the main bus station. To get to the university, listen up for "Legon!". If you are catching a tro-tro out of town, head to the tro-tro depot and ask for the right "express" tro-tro to your destination. Tro-tros only leave when they are full. If you are in a big city like Accra or Kumasi, you usually won't have to wait very long for the vehicle to fill up and leave. But if you are taking a long-distance tro-tro it can be a very hot, stuffy hour of sitting and sweating while you wait for the touts to fill up the seats. If possible, try to get on a tro-tro that is already quite full. For more remote locations, tro-tros may only depart in the morning, so check the day before for approximate departure times. There are generally fewer tro-tros on Sundays, unless it's a market day. In cities where you're just getting from A to B, you pay your fare to the "mate". He'll be holding a wad of notes and be the one who is yelling out the destination. For longer hauls from town to town, you will usually buy your ticket from a Private Transport Union booth. Tro-tros are cheap: expect to pay around five cedis or less for every 100 kilometers. Within a city, fares are rarely more than 20 - 50 pesewas, which amounts to a few coins. It's important to have small change with you at all times when riding tro-tros in a city. If you hand a mate a 10 Cedi note, don't be surprised if grumbling ensues. A tro-tro is not a good place for claustrophobics. Everyone gets a seat, but most tro-tros are modified to fit extra seats - so be prepared to get close to your fellow passengers. In a city like Accra, you're generally sitting with well-dressed commuters and school kids in relative dignified silence. No music blasting, and plenty of hawkers selling cold water, doughnuts, and plantain chips to keep you satisfied on slightly longer trips. Long-distance tro-tros in more rural areas mean you may be sharing the ride with lots of goods and the occasional livestock. There are hawkers on all the main streets in Ghana, at traffic lights and tro-tro stops. Fellow passengers will help you purchase all manner of street foods and goods, including peanuts, water, doughnuts, batteries, lottery tickets and tablecloths. If you can get a window seat, it's easier to see what is on offer. Once you have your seat, it's not common to get off and stretch your legs while at a stop (where you'll wait for the tro-tro to fill up again). If you do want to get off, choose a seat that puts you in the way of disembarking passengers and use that as an excuse to get out with them. Ghana's roads are not always in great condition. Drivers work long hours and road accident rates are very high. Tro-tro accidents occur fairly frequently. The Bradt guide to Ghana suggests you take a long-distance bus or taxi if you have that option rather than a tro-tro, because of the high accident rate. And that's despite the wonderful Bible quotes and Christian slogans painted on the windshields. 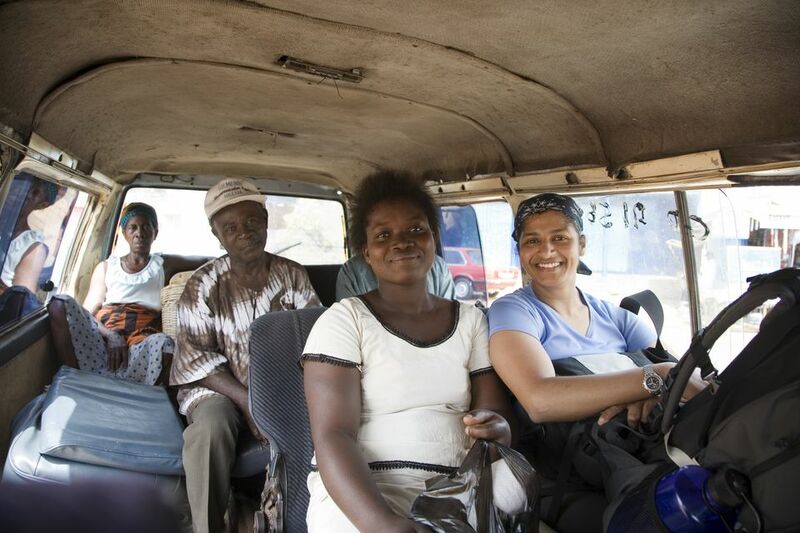 At least one tro-tro ride is a must in Ghana, if only for the experience. But if you can afford a more luxurious and safer option for long-distance journeys, consider saving your tro-tro rides for inner city trips instead. Top Tip: Given the cozy conditions inside the tro-tro, your luggage will ride on top. At busy tro-tro stops, you may get some enthusiastic help with your backpack - just make sure that it ends up on the same tro-tro as you. Check to make sure that your bag is tied down properly and don't leave anything valuable inside. Waterproof covers are handy and make it more difficult to slip things out of the side pockets.